Q&A: What's the best lens for portrait photography? Q&A: What’s the best lens for portrait photography? Question from Brandon L.: I have a Canon EOS Rebel T6i that came with a standard 18-55mm zoom lens. I’m happy with that lens, but I think I’ll need a different one before long. I want to take up portrait photography and I’ve read that prime lenses are better than zoom lenses for that. I was hoping you could recommend a really good portrait lens that’ll work with my camera. Cost is important to me as I’m disabled and on a relatively modest fixed income, but I’d eventually like to do this as a means of earning extra money so I don’t mind spending more as long as the price is reasonable. I realize that no one lens is perfect for all situations, so your recommendation for just a good portrait lens will be greatly appreciated. Thanks in advance for your advice! Rick’s answer: Brandon, I’ve used a lot of different lenses in my day and I’ll be happy to give you my opinion on a great lens that I believe would serve you well as a portrait photographer. Just be aware that this is only my opinion, and I’m sure that other photographers have their “favorite” lenses as well. The above being said, I really like this Canon EF 85mm f/1.8 USM Medium Telephoto Lens for shooting portraits. This lens captures crystal-clear images and it works extremely well under low-light conditions, and the fixed 85mm focal length is great for capturing near-perfect portraits. And perhaps even more important, the wide aperture makes it easy to create stunning images with beautiful blurred backgrounds. Another plus for this lens is you’ll be able to use it if you eventually decide to replace your T6i with a newer Canon DLSR of the same format. Bottom line: While there are cheaper third-party lenses out there that are comparable to this one, I believe this tried-and-true Canon 85mm lens will serve you best you begin working as a paid portrait photographer. 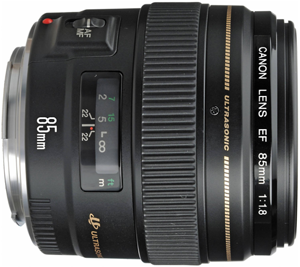 Click here to read more about the Canon EF 85mm f/1.8 USM Medium Telephoto Lens at Amazon. I hope this helps Brandon. Good luck! Bonus tip2: Want to make sure you never miss one of my tips? Click here to join my Rick’s Tech Tips Facebook Group!